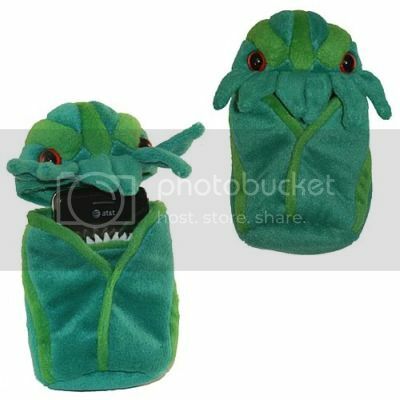 Sure, the Cthulhu plush cell phone holder from Entertainment Earth seems completely impractical, unruly, and even a little bit* silly, at first. But with the release of details on the iPhone 4, now it makes perfect sense. Plush Cthulhu will nourish itself upon the simmering evil of AT&T’s bait-and-switch tethering plan, thereby simultaneously protecting me from both Cthulhu’s malevolent hunger and AT&T’s soul-blackening treachery. Via Nerd Approved, whose hunger tends more to the melodious than the malevolent. Which, yeah… is weird. I’m going crazy & it’s all your fault! I saw this thing here, ordered one for my Droid Incredible, and it’s backordered! Originally said July, now August, and now we’re halfway through August & I really want my Cthulhu. You’re a bad influence.